All quotes given over the phone or via email are subject to change in case we detect differences between the situation as we have been informed and the reality we find on the premises. At Cleaners Uxbridge we accept two main methods of payment: cash payment and bank transfers. Making a cash payment is expected after completion of the service and means that the client agrees that the service was delivered properly and there are no complaints about the quality of work done. Should the client fail to deliver a cash payment upon completion of the service, they are expected to do so in three-days time. All relevant banking information will be provided. Bank transfers are expected at least 24 hours prior to delivery of the service. A bank transfer proof should be sent via email to the company in due time. Corporate clients are expected to deliver a bank transfer payment no more than 30 days after completion of the service. A 50% deposit is expected for all services of and more than 500 GBP. Booking a service shows an agreement for the company to organise and carry out the said service and means that the client agrees to pay for it in full. Failure to do so may result in the company taking legal actions to secure the payment, and/or report to the relevant UK authorities and/or publishing the name of the client as a Bad Debtor in local media outlets. The booking of any service means that the client has read and agrees to the terms and conditions presented here. Cancellations are accepted free of charge up to 48 hr prior to the scheduled delivery of the service. Cancellations after that period has elapsed are subject to a flat fee of 50 GBP. Regular cleaning services are rescheduled 48 hr prior to the scheduled delivery of the service and cancelled no less than a week prior. The Client is expected to pay for the regular service in full should they fail to reschedule or cancel in the given time-frame. Cancellations can be made over the phone and via email. The Company reserves the right to refuse an appointment if the conditions at the property are deemed hazardous, as well as when unexpected circumstances and accidents befall the cleaning team. The Client is requested to provide running water and electricity at the property that is to be cleaned. Failure to do so may result in a flat non-refundable fee of 50 GBP. Access to the property should be provided by The Client, and no special skills and methods should be required in order to lock doors or move from one place to another during the cleaning process. A flat, non-refundable fee of 50 GBP applies upon failure to do so. The Client is requested to arrange for a suitable parking space for the cleaning team’s vehicle, and cover any congestion and parking charges. All cleaning teams are covered by Public Liability Insurance. Any claims that need to be covered by the Company need to be made no more than 24 hours after completion of the service. Furthermore, the company has the right to refuse access to confidential documents and information. Refund claims are not considered once the delivery of the service is completed. All services are considered successfully delivered unless a written notice is sent from the Client to the Company up to 24 hours after the job is being carried out. The Company has the right to attempt to finish the job up to the Client’s satisfaction before any third parties are involved. The Client needs to provide the Company access to disputed areas and items for re-cleaning within 24 hours after the signal is made. The Client is required to be at the premises during the re-cleaning at all times. The Company offers one re-cleaning per service. Replacement of broken items with identical ones cannot be guaranteed. Repair and replacement of damaged items is made at their current cash value. Sentimental value cannot be compensated. All liability claims are considered once the service is paid for in full. The Company is not responsible for damage and actions conducted by third parties present at the property during the delivery of the service. Cash, jewellery, art, antiques and items of sentimental value are not subject to liability by the Company. The Client is requested to store those away for the duration of the delivery of the service. The Company cannot be held liable for pre-existing damage to the property, including stains, dirt and burns that become more visible once the cleaning is completed. The Company cannot be held liable for carpets shrinking due to poor fitting. The Company cannot guarantee that appliances are being cleaned up to the client’s satisfaction in case those have not been maintained properly up to this moment. The Company can guarantee that freezers are cleaned only if they are properly defrosted in advance. 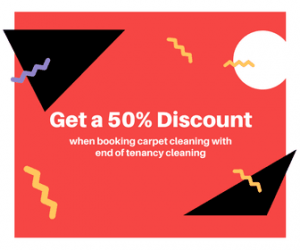 Results in end of tenancy cleaning cannot be guaranteed if there is still furniture or people present at the property at the time of the cleaning. The same goes for After Builders Cleaning when the work on the site is not completed yet, and/or there are people present at it. Damage on carpets caused by the client placing furniture on it before the carpet has fully dried is not a subject of liability by the Company. The Company cannot be held liable for damage caused by faulty equipment and expired products that have been provided by the Client. Special deals cannot be combined with other discounts and fee-reductions and they do not apply to minimal charges. Additionally, special deals and offers are a subject to availability and are usually offered for pre-determined time slots and days. The Client agrees to receiving the Company’s newsletter by providing their email address to the Company.